Issued in a cardboard sleeve with jiffy bag material around. Inside is another cardboard sleeve and a 6-panel fold-out insert. 11: Additional productsion and remiks at Out ov Rosenheim Studio. Made in France. CD made in Portugal. 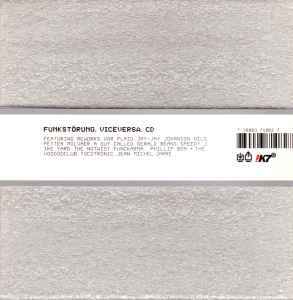 Funkstörung’s second album of remixes, VICE VERSA, picks up where the first left off, but finds them in a more considered mood. Plaid’s “Eyen” is given a much less frenetic mix, matching, in part, the original; the same goes for their revision of The Notwist’s “Moron.” And their version of Jay-Jay Johanson’s “I Want Some Fun” finds a strange balance between lounge easy-listening and a funky drum pattern. Funkstörung show much more range here - - listen to their treatment of Louise Rhodes’ vocals on A Guy Called Gerald’s “Humanity.” Their stop-start cutting of the rap on “Salt” (by the Beans) or “N.C.R.” (by Ike Yard) emphasizes their reconceptualization of hip-hop. A real treat for the ears. There are some great tracks on here. This encompasses all of Funkstorung's remixes up until this was released. The Beans and A Guy Called Gerald mixes are worth it alone for this album. Check out 'Additional Productions' for more Funkstorung remixes.